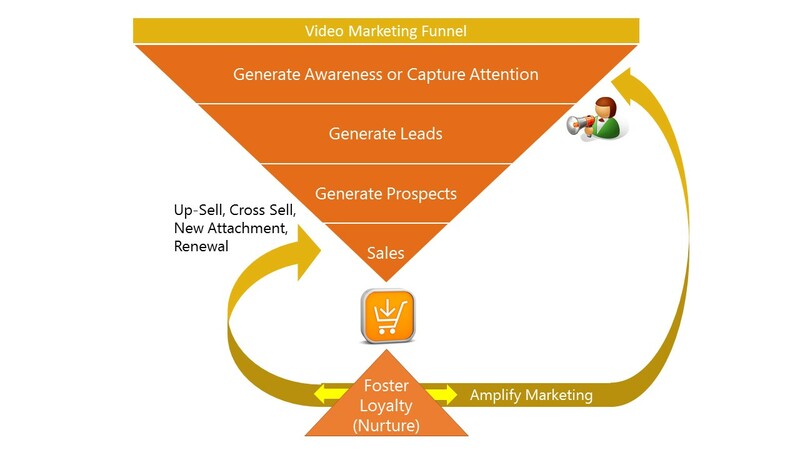 I'll be the first to admit that the world doesn't need another sales and marketing funnel, and I'm confident you'll find nothing new or surprising about the one included here. In fact, some might argue that the funnel should now be a circle or a cloud or some such modernized shape. 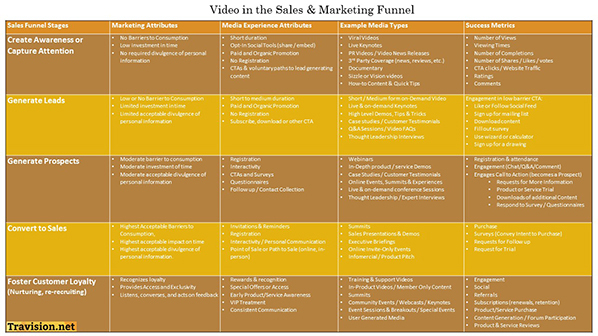 Having said that, a funnel works just fine in the context of this post because my focus is not on the funnel itself, but on video marketer behavior within its various stages. Very often I see marketers and webcasters capturing and celebrating the same sets of metrics (views, shares, likes, completions) regardless of where that content lives in the funnel. In reality, the goals are unique in each stage and should, therefore, drive very different measurement and success criteria. Furthermore, one also shouldn't overlook the fact that audiences have a different relationship with (and expectation of) marketers depending on where they sit in the funnel. 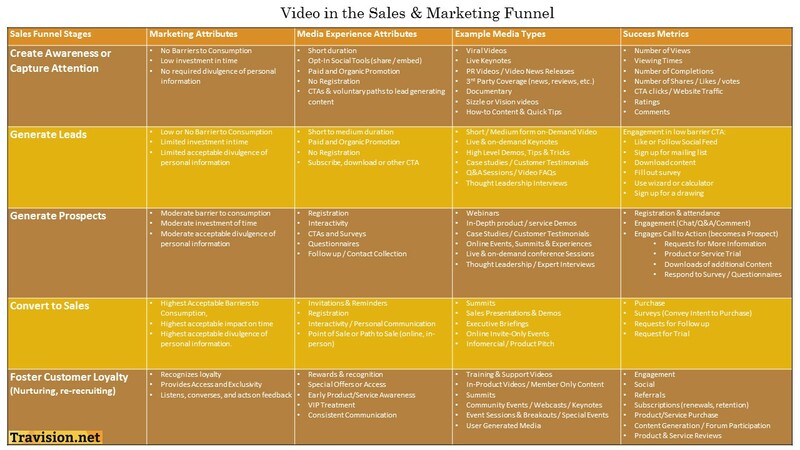 In short, when it comes to designing experiences and success metrics, video marketing is not one-size-fits-all. By way of example, I once managed a webcast that aimed to capture an audience via paid banner advertisements on popular websites throughout the course of the live broadcast. The first part of the strategy worked. The banners captured people's attention and they clicked through to the webcast. Unfortunately, the business owner couldn't justify delivering the webcast without capturing attendance through a short registration process. In the prospect or sales generating stage, a registration page is acceptable and expected (and usually provided ahead of time). However, in the awareness generating stage (where this event clearly resided given the need for banner advertisements), the registration component negated the entire campaign. Potential audiences were lured to the content, and then shown a locked door they could only open by providing information about themselves. They had yet to receive any value from the content, but they were already being stopped and asked to pay a cover charge consisting of their time and personal data. The strategy was doomed to fail. Instead of taking this route, they might have considered deploying the same demand generation strategy, while foregoing registration in exchange for other less demanding and more rewarding interactions. After all, they had already done the hard part of getting the audience to the front door… they just made the door too difficult to open. In an attempt to help people break out of this one-size-fits-all mentality when it comes to video usage, I created the simple table below. It aims to provide some ideas about how to think about the content experience and success metrics in the various stages of the funnel. It's based on years of experience producing media content and witnessing audience behavior. Still, the last thing I want to do is replace the existing one-size-fits-all approach with a different one. 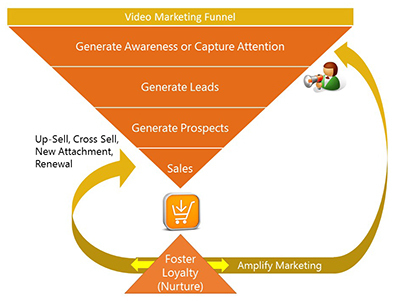 There is variation in what people are trying to accomplish with media, even in similar stages of the funnel. Moreover, audiences and expectations can differ from industry to industry. This is a guide, hopefully a very helpful guide, but it's not gospel. If it helps provide a little clarity of purpose - it will have done it's job. As usual, I welcome and encourage feedback. Update: Since publishing this, I was tipped to a good resource for digging deeper into the "Barriers to Consumption" concept. The sales funnel slide and the Content Marketing Manifesto by kunocreative are great resources for diving deeper into that topic.